Check back in April for information about the 2019 Summer Reading Program! 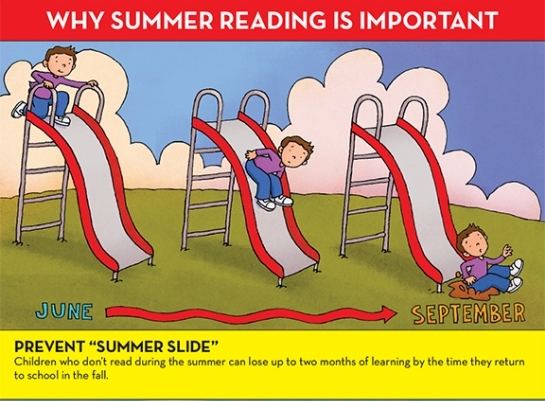 The benefits of summer reading are clear. National research from Dominican University finds that students who participate in public library summer reading programs scored higher on reading achievement tests at the beginning of the next school year than those who did not participate. Parents of children enrolled in the public library summer reading program reported that their children spent more time reading over the summer, read more books, were well prepared for school in the fall, and read more confidently. Young people experience learning losses when they don’t engage in educational activities during the summer. Research spanning 100 years shows that students typically score lower on standardized tests at the end of summer vacation than they do on the same tests at the beginning of the summer. Libraries are part of the solution. To succeed in school and life, children and young adults need ongoing opportunities to learn and practice essential skills. Summer Reading Club reminds kids that reading is for fun—as well as for learning. There’s so much to see, so much to do at your library! There’s no better place to take your kids. The library is a place to learn, read, and have fun…a place the whole family can enjoy. In fact, more than 82 million children attend library programs every year. Studies show that children who are read to in the home and who use the library perform better in school and are more likely to continue to use the library as a source of lifetime learning. The amount of time children spend reading outside of school is linked to gains in reading achievement. Numerous studies show that access to books and magazines is directly related to higher reading achievement.